December 15, 2017 marked the 50th anniversary of the Silver Bridge collapse in 1967. The iconic 1760 foot long suspension bridge, built in 1928 on the Ohio River, connected Gallipolis, OH and Point Pleasant, WV. Its aluminum paint earned it the “Silver Bridge” moniker. The bridge was almost like family to the communities. It was an elegant landmark, the pride of the region promoted as a tourist attraction (see image below), and a vital transportation link. Suddenly, at 5:00 that afternoon in 1967, it was.....gone. Forty-six people died in the tragedy which attracted national attention. The greatest legacy of the tragedy was loss. It forever changed the lives of hundreds of victims' loved ones. Witnesses and first responders suffered nightmares, fear of water, and anxiety about crossing bridges. Most recall details vividly, decades later. Christmas season was difficult for many years. A positive legacy was a series of actions leading to improved bridge safety nationwide. An early safety impact was the closing of the similarly designed Hiram Carpenter bridge in St. Marys, WV. The Interstate 77 bridge in Marietta was opened a few days early because of the St. Marys bridge closing. At 4:55 on December 15, 1967 rush hour traffic crossing the Silver Bridge was slowed by balky traffic signals. Dozens of cars and trucks backed up bumper to bumper on the aging bridge. Witnesses reported swaying, loud noises, then violent lurching. The bridge began falling apart, domino-like, toward the West Virginia side. The bridge deck flipped over tossing vehicles into the water “like children’s toys.” The superstructure then plunged into the river, crushing many of those vehicles. Several survivors were rescued from the water and mangled steel on the Ohio side river bank. A large truck floated downstream. After that, the scene was eerily quiet. Hundreds of onlookers gathered, but there was little to see. The Ohio River - more than 30 ft deep - had swallowed up everything. A few Marietta area people were soon present at the scene. Then Sheriff Richard Ellis and a few deputies hurried down to the site to help with emergency crews. Ellis's vehicle was one of a very few that had a public address speaker. They used that for crowd control and other activities. In a Marietta Times article, Ellis described the devastation he saw on the Ohio side as "unbelievable." Don Yoho, Larry Barnes, and Guy Meeks from Washington County were employees of Hocking Valley Steel working on a job just north of Gallipolis. They helped extract a trapped man from a truck and brought a truck crane from their job site to help if needed. Cliff Winstanley, Jr., the Game Warden for Washington County, was on law enforcement duty there the day after the tragedy. He was assigned to keep unauthorized persons away from the scene on the Ohio side. There also was concern for looting; one of the damaged trucks was loaded with cartons of cigarettes. Recovery of victims, vehicles, and bridge structure elements went on for weeks. Divers braved treacherous currents, low visibility, cold water, and a jumble of steel. A morgue was set up. The communities were flooded with reporters. Planes buzzed overhead taking aerial photos for news outlets. Interviews of witnesses and victims’ families evoked the wrenching trauma of the event. Recovered bridge parts were laid out in an open field for analysis to determine what happened. Dozens of funerals honored those lost. Hundreds of their loved ones and friends were left to carry on as best they could. The Silver Bridge had been showing signs of age. It swayed up and down when traffic loads were heavy. Jack Fowler, Director of the Point Pleasant River Museum, said in an interview that ".....(the bridge) was always swaying. It had the up-and-down motion from so much weight on it, and everybody always said wow this bridge is going to fall someday." People were unnerved by the motion. Yet many accepted it as an aspect of the bridge’s unique design. The Mayor of Point Pleasant had expressed concerns to state officials and had imposed traffic limits at times. This resulted from a combination of wear and much greater traffic loads than anticipated in the design. The Silver Bridge was designed in the mid-1920s. The NTSB report noted that long term effects of corrosion, stress, and much heavier traffic loads were not foreseen then. Unfortunately, the increasing traffic load had not been compensated for: there were no load limits in place on the Silver Bridge. The design of the bridge made it vulnerable to a failure of even a single suspension structural element. The suspension support came from a series of side-by-side 55 ft long steel eyebars linked together to form a chain. One of the Silver Bridge eyebars fractured at a point of stress. The companion eyebar could not bear the load and was torn apart. That was it; the suspension chain was separated, and the bridge fell apart. Only three bridges of this suspension design were built. One was in Brazil. The other, known as the Hiram Carpenter Bridge, was only seventy miles upriver at St. Marys WV. This bridge was closed as a precaution three days after the Silver Bridge collapse. The Interstate 77 Ohio River Bridge at Marietta, had been completed and scheduled to be opened on Monday, December 18, 1967. But closure of the Hiram Carpenter Bridge prompted officials to open the I-77 bridge early. Ohio Governor James Rhodes and West Virginia Governor Hulett Smith conferred Friday evening. They decided to open the new bridge that night. The Ohio Highway Patrol notified Marietta Police at 9:06 p.m. Road crews began moving barricades and uncovering signs. Marietta leaders sprang into action. S. Durward Hoag was given the honor of being the first to cross the new bridge. Hoag was the owner of the Hotel Lafayette and a tireless civic booster. He was credited with influencing the decision to add I-77 to the Interstate system. He drove across at 10:19, only 73 minutes after the notification from the Highway Patrol. He was accompanied by Marietta Mayor John Burnworth and Williamstown Mayor Aubrey Rymer. Other officials were also on hand for impromptu ceremonies. Highway crews also worked to open the Interstate highway section from New Years Hill to Macksburg on the following Monday. The Hiram Carpenter Bridge was a carbon copy of the Silver Bridge - built in 1928, just months after the Silver Bridge, by the same company, according to the same design. It, too, was a beautiful span across a scenic section of the Ohio River. However, it carried far less traffic. Walter Carpenter, a son of Hiram Carpenter, spoke about the bridge closing in an interview. He said local residents were convinced by the Silver Bridge collapse that "the (Hiram Carpenter) bridge could fall at any time." That feeling "...sealed the fate of the bridge. The NTSB had....to condemn the bridge because they could not prove it was safe." The bridge was closed for further assessment and finally condemned June 18, 1969. A new bridge would be built. Hundreds witnessed demolition of the old bridge on June 29, 1971. Only five pounds of explosive on two sections of the eyebar suspension were required to bring it down - testimony to the design vulnerability that brought down the Silver Bridge. A new bridge was built and dedicated November 19, 1977. The tragedy spawned an outpouring of curious folklore. More than a dozen songs were written. Some were recorded. One song attributes the disaster to Indian Chief Cornstalk's curse, supposedly uttered after he had been mortally wounded by soldiers at Point Pleasant in 1777. 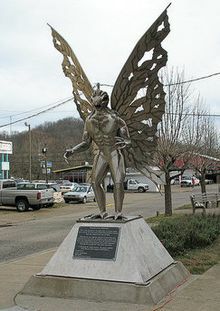 John Keel in his 1975 book The Mothman Prophecies linked the tragedy to paranormal events in the area, including alleged sightings of the Mothman. One positive Silver Bridge legacy was a new emphasis on bridge inspections and safety. On December 20, 1967, only five days after the Silver Bridge tragedy, President Lyndon Johnson appointed a task force to study bridge safety. The Highway Safety Act of 1968 passed on August 24, 1968 included a provision for the Department of Transportation to establish a formalized program for bridge inspection. It was also to train personnel needed to perform the inspections. States began to review their bridge inspection programs. Only 17 states were found to have adequate such programs. Fifteen months later, 10 more states had revised their standards and 24 states initiated new programs. Ironically, the NTSB report stated that the flaw that caused the failure ..."could not have been detected by any inspection method known in the state of the art today (1970). To paraphrase one observer: "The fatal flaw which spawned better bridge inspection procedures could not have been detected, no matter how good the inspection (at the time)." The bridge task force issued its report in March, 1969, finding that of 563,000 bridges in the country, about 70% were built prior to 1935. Many of these "would need repair or replacement in the intermediate future." The report concluded that there were about 24,000 “critically deficient” bridges on the Federal-aid system and that repair or replacement of the bridges would cost $6 billion. Another 64,900 critically deficient bridges were not on a Federal-aid system and would cost state and local governments an additional $8.8 billion to repair or replace. Bridge concerns became a major infrastructure focus which persists to this day. Survivors and witnesses have told and retold their poignant Silver Bridge stories over the years. Frank Wamsley was a 28 year old truck driver headed home to Point Pleasant in a gravel truck with a friend. His cousin Barbara and her husband Paul Hayman were crossing the bridge towards Ohio. He passed them and waved. Frank's uncle, Marvin Walmsley, was also on the bridge with two friends. Frank's truck sank with the bridge; he managed to escape and was rescued. His passenger and everyone in Marvin Wamsley's car died. His cousin Barbara and her husband made it across. Howard Boggs was on the bridge with his wife and their 18 month old daughter. He commented, "The bridge is sure bouncing around today." Minutes later he found himself on the bottom of the river outside of his car. Somehow, he does not remember, he surfaced and was rescued. His wife and daughter perished. Tractor trailer driver Bill Needham, then 27 years old, of Ashboro, NC, was grumbling about the traffic back up. Soon he was in the water. "It (the bridge) just went. We hit the the water and sank like a rock." He managed to escape, surface, and cling to a floating box until rescued. His driving partner, Robert Towe, married with three small children, did not make it out of the truck. Needham is now retired and recalled the event in a recent Associated Press article about the event. "I expected to be killed. I really did." Point Pleasant resident George Byus came home from work. His wife wanted to go to the Bob Evans restaurant on the Ohio side to eat. He protested that he was too tired. His wife and two daughters went across the bridge to get take out food. They never returned. One of the daughters was never found. The day of the collapse Steve Darst had driven his uncle across to the Ohio side. Traffic on the bridge was backed up because of a faulty traffic light. He sat uneasily on the bridge. He recalled, "I didn't like the feeling....I told my uncle, 'Hang on, I'm going to fly this bridge.' I passed 40 some cars and went through the red light..I probably hit 90 (miles per hour)." Later he hustled back across the bridge to Point Pleasant - just before it went down. A pregnant Charlotte Wood started over the bridge from Point Pleasant. She had visited her parents and was headed home to Gallipolis. The bridge began shuddering. She recalled her riverboat captain father talking about barges striking bridge piers. Immediately she started backing off the bridge. Her car stalled. It coasted back and stopped just beyond the edge where the bridge dropped off. She was helped off the bridge in shock by State Trooper Rudy Odell and Robert Rimmey. "It wasn't my time to go," she said later, "The Lord had something else for me to do. I had twins in (the following) April, a boy and a girl. I didn't know I was going to have twins at the time. The Lord left me here for that, I'm sure of it." 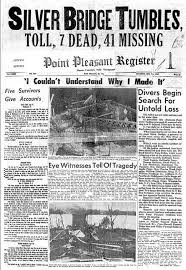 "Point Pleasant, WV, Silver Bridge Over Ohio River Collapses Dec 1967,"
Thanks for this article. My father reminded me that we crossed the Silver Bridge just a few days before its collapse. He commented then that it was bouncing a lot. It was one of the most beautiful bridges I've ever seen. A sad story, but the positive outcome is that there is much more awareness of bridge safety. We just need to find more funds to ensure that the bridges are all safe.